Two Brazilian children at play juxtapose recent findings that Brazilian children are the least active in Latin America. A new partnership between Nike, Inc. and nine Brazilian organizations will work to counter this trend, yet sustainable urban transport and planning can also play an important role in increasing physical activity. Photo courtesy of NIKE/Designed To Move . If global trends in physical activity continue as they stand today, Brazilians will be 34% less active by 2030 than they were in 2002. By the same year, China’s physical activity levels will have dropped by half – 51% – since 1991, and India’s by 14% since 2000. Today’s children, all over the world, are the first generation to have a shorter life expectancy than their parents. In short, we’re experiencing a global physical inactivity epidemic. The economic costs of this epidemic are both startling and sickening: in 2008, physical inactivity cost the U.S., China, India, and the U.K. a combined USD $200 billion. Designed To Move is an initiative led by NIKE, Inc. to get our world moving again, since physical activity not only improves health but unlocks human potential – the driver of economies. Through focusing on children ten years old and younger, the initiative works to instill a value for physical activity in kids before their preferences and motivations are cemented during adolescence. Since physical activity encompasses any form of physical movement, sustainable transport modes like mass transit, walking, and bicycling, can play an important role in boosting the health of urban residents worldwide. 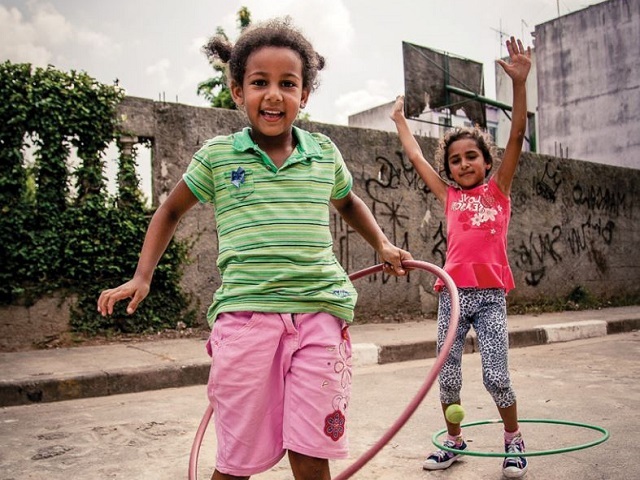 Recent studies indicated that Brazilian children are the least active in Latin America. In response, NIKE, Inc. has announced a partnership with nine Brazilian organizations that will dedicate USD $16 million over three years to fight physical inactivity in the country. The announcement was made on December 9 at the Clinton Global Initiative Latin America meeting, which was held in Rio de Janeiro, Brazil, from December 8 to December 10. The Clinton Global Initiative was established by former U.S. President Bill Clinton to address the world’s most pressing challenges, and President Clinton joined Mark Parker, president and CEO of NIKE, Inc., in announcing the new partnership. The nine Brazilian organizations that will partner with NIKE on this project operate in a diverse range of sectors, including the private sector, government, NGOs, and multilateral agencies. Their strategy is to sow the seeds for a culture of physical activity among young children beginning with an Active Schools pilot project, which will hopefully help children grow into healthier and more active adults. So where are these inactive Brazilian children? Most live in cities. According to the Population Reference Bureau, Brazil was 84% urban in 2012. And the global population is not far behind: over half of the world’s population currently lives in cities, and by 2050 seven out of every ten people will be urban residents. Equitable access to transport is essential to the functioning of cities everywhere, and to ensuring that citizens are connected to opportunities. Since people need to move to tap into opportunities their city offers, including work, school, and play, advancing sustainable urban public transport systems has never been more critical. This link between sustainable transport and physical activity is admirably included in the Designed To Move Full Report. While it’s easy to understand that walking and bicycling count as physical activity, research has shown that people who take public transport get more physical activity than those who use private vehicles, too. Since using a mass transport system such as bus rapid transit (BRT) or metro generally involves walking or bicycling to and from stations, public transport passengers have a head start over private vehicle users to getting the World Health Organization’s recommended amount of physical activity just from their daily commute. Efforts like Designed To Move are an important step towards making our cities healthier and happier places to live. While sustainable transport is one way to increase physical activity in cities, urban design can also play a critical role in providing adequate and safe infrastructure for exercise and recreational activities. The solutions to the global physical inactivity epidemic are out there – we just need to facilitate their implementation…and get moving! This post was inspired by a blog post published in Portuguese on TheCityFix Brazil. Vancouverism: The prescription for a healthier city?